The Fifth in the class of 06 New 105M Offshore Patrol Vessel (OPV), “ICGS SHAURYA” built on GSL In-house design was delivered to the Indian Coast Guard recently (07th July 2017), Thirty two days ahead of the contractual schedule, earning a unique distinction for GSL of delivering all 5 CGOPVs, ahead of contractual schedule in a row. This largest and most advanced new generation OPV was handed over by Shri S. P. Raikar Director (Operations), GSL to DIG D S Chauhan , Commanding Officer (YD 1222) in presence of DIG H P Singh, Principal Director (MAT) Indian Coast Guard and DIG Atul Parlikar, TM CGRPS (Goa) in a simple ceremony held at GSL on 07th July 2017. Cmde B. 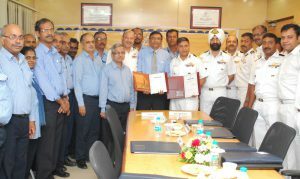 B. Nagpal Director (CPP & BD) and other officials of Indian Coast Guard and GSL were also present on the occasion. The delivery of this 5th OPV to Coast Guard bears significance as GSL has been concurrently working on export projects, having delivered the 2nd FPV for Mauritius on 30 Apr 2017. Further, Sri Lankan OPV is also likely to be delivered on 24 Jul. Thus in the calendar year GSL have already delivered 2 CGOPV, 1 MFPV and 1 SL OPV (due for delivery on 24 Jul), which amounts to cumulative tonnage of 7700 ton within 7 months of this calendar, highest in the history of GSL – or any shipyard in the country. Incidentally, the ship was handed over by Offg. CMD, Mr S P Raikar as CMD, Adm Shekhar Mital was visiting Russia to sign the Building Protocol / Technical Agreements with Russian Side for building advanced Missile Frigates (Project 1135.6) indigenously at Goa Shipyard.